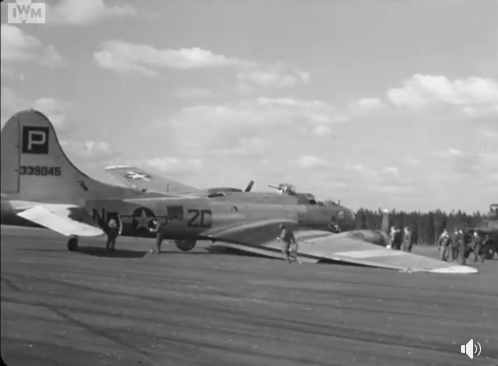 3-Mar-45, photo taken after emergency landing at Woodbridge. Comment by Ivo de Jong: Lt Richardson landed the aircraft at Woodbridge after a fire burned away the mounts of the number three engine and it fell out of the wing. Note that the number four engine was most likely feathered when the landing was made (top blade is not bent). The crew can be seen vacating the aircraft and watching the engine. The aircraft was repaired and eventually scrapped in the USA. To see film of this aircraft in Woodbridge and crew inspecting damage, use this link. Go to 6:45 of the video and watch from there to the end.